Free Fulldome Programs and Clips - International Planetarium Society, Inc.
A note about downloading large programs from ESO: The best practice is to use a third-party download manager such as Free Download Manager, DownThemAll, or others. Then use an unzip program such as 7-zip or WinZip (Windows). ...a free full-dome short series produced by the University of Colorado’s Fiske Planetarium and funded by NASA. It highlights the research and people working with NASA. Most titles average just over 5 minutes. The latest ones are Parker Solar Probe (see preview) and New Horizons flyby of the Kuiper Belt Object MU-69 (January 2019 - see preview). An order form will get you instant access to the entire library of free programs from Fiske. H.264 - 1K, 1.5K, 2K movies are available for most titles. H.265 UHD 4K movies will be coming in the future. If you need further encoding/processing help we recommend. Upcoming episodes to include Apollo Lunar Geology, Orion/SLS, SOFIA .... Order form: https://www.colorado.edu/fiske/about/fiske-productions-request-form. 12 March 2019 and 30 November 2018. ...an open-source planetarium show illustrating the important role played by astronomical observation in the evolution of pre-Hispanic cultures in central Mexico. The 20-minute show was produced by Frutos Digitales in collaboration with ESO. The ESO Supernova Planetarium & Visitor Centre is excited to add Mexica Archaeoastronomy: Between Space and Time to its growing collection of planetarium shows.. Download from https://www.eso.org/public/announcements/ann18072/?lang. 8 October 2018. See IPS News Item for more details. 25 September 2018. Discover the secrets of our star in this planetarium show and experience never-before-seen images of the Sun’s violent surface in immersive fulldome format. The passage of the Sun’s fiery disc across the sky — day by day, month by month — was the only way to keep track of time for countless past civilizations. Don’t be fooled by the terminology; although it is a typical dwarf star, the Sun consumes 600 million tons of hydrogen each second and is 500 times as massive as all the planets combined. Download from https://www.eso.org/public/videos/The-Sun-show/. 6 September 2018. 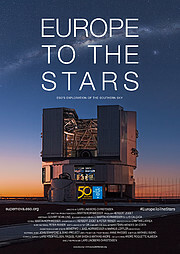 Europe to the Stars takes the viewer on a journey behind the scenes at the most productive ground-based observatory in the world—the European Southern Observatory—revealing the science, the history, the technology and the people. The movie goes from locating the best places in the world for observing to how telescopes are built and what mysteries of the Universe astronomers are revealing. Download from https://www.eso.org/public/videos/europe-to-the-stars/. 13 August 2018. The 20-minute show, produced by Frutos Digitales in collaboration with ESO and financed by the National Council of Science and Technology of Mexico, premiered in Spanish at the Cha’an Ka’an Planetarium in Cozumel in 2017. This is the first show fully animated for fulldome made in Mexico, and it is being distributed freely to the more than 30 planetariums in Mexico as well as internationally through ESO’s online distribution network. A photon's journey across space, time, and the mind. Planetarium show based on a 1-hr PBS documentary "Sight: The Story of Vision" weaving a tale of the journey of humanity that discovered the science, technology and medicine that allows us to understand how sight works, cure diseases of the eye and correct vision. http://storyofsight.com. Register at http://www.storyofsight.com/IPS/Zeiss_Seeing/ to access downloads. 30 Nov 2016. From the journey of protons racing through the world’s largest particle collider in Europe to up-close views of the Big Bang and emergent universe, and the nearly mile-deep descent to an underground experiment in South Dakota, a new planetarium show is designed to immerse audiences in the manifold search for dark matter. For free download, go to: http://www.eso.org/public/videos/potu/. To get the show on a free hard drive, visit http://phantomoftheuniverse.com/contact-new1.html. Website for the show is http://phantomoftheuniverse.com. 12 Oct 2016. From Brno Observatory and Planetarium. Discover our star through the breathtaking timelapses from real images taken by the Solar Dynamics Observatory and processed by advanced mathematical methods. 11 minutes. http://www.brnoplanetarium.com/theincrediblesun. 4 August 2016. ...presents the achievements of modern astronomy, the most advanced terrestrial and orbital observatories, the basic principles electromagnetic radiation and the natural phenomena related to the High Energy Astrophysics. Astronomy Photographer of the Year (14:15, 30fps 4k domemasters) from Royal Observatory Greenwich comes shipped on a USB3 1TB drive (yours to keep) with a comprehensive, full-colour A4 presenter’s guide. Live presentations encouraged but an optional narration track is supplied with an original musical score. http://www.fddb.org/fulldome-shows/astronomy-photographer-of-the-year-2015/ To get a copy, see the form at http://bit.do/APY2015 ...a lower resolution video is also available for download. 10 November 2015. (30 minutes, 4K) ...a journey of celestial discovery, from the theories of the ancient Greek astronomers to today’s grandest telescopes. The show was produced for the ESO Supernova Planetarium and Visitor Centre, to be opened in 2017. From European Southern Observatory. 10 June 2015. A 7-minute planetarium mini-show produced by the education and Public Outreach Department (ePOD) of the European Southern Observatory (ESO), available for free in 4k resolution. November 2014. New Horizons for a Little Planet is a new free fulldome show is a lighthearted introduction to NASA's New Horizons mission to Pluto and the Kuiper Belt. The show is distributed by Audio Visual Imagineering (AVI) and comes with a resource package. From Hartnell College Planetarium, November 2014. Waiting Far Away has been translated into French, German, Russian, and Czech. Contact Jason Fletcher at the Fulldome Blog (link above) for information. Jason reports that translations also are available now in Farsi, Korean, Portuguese, Spanish (Castilian), and Telugu. These video clips are not whole programs. They may be used as elements in relevant programs. ESO provides Fulldome video resources to accompany their press release on the TRAPPIST-1 planetary system, "Ultracool Dwarf and the Seven Planets" https://www.eso.org/public/usa/news/eso1706/. Fulldome video is near the bottom of the page. See also Spitzer page: http://www.spitzer.caltech.edu/trappist-1 (especially link 3D Planet & Star Maps at bottom right). 22 Feb 2017. Geometry of solar and lunar eclipses—previews from Rice University (by Don Davis, with NASA Heliophysics Education Consortium support. To get non-watermarked versions, sign up for the update email list, then email Pat Reiff. http://space.rice.edu/eclipse/eclipse_animations.html. January 2017. Unusually spectacular aurora displays in Canada. Login with "guest" and "augso". Use right-click or control-click to download. Low-resolution MPEG previews (320-pixel-diameter fisheye views) are available for download to digital dome show producers and presentation venues at no fee. Orion Nebula in visible light by Frank Summers, shown at the Pleiades conference in October 2017. HD version: http://hubblesite.org/video/1010/science and https://www.youtube.com/watch?v=maqCZhIg9uU -- Dome version: http://hubblesite.org/video/1008/science and https://www.youtube.com/watch?v=42jCVx9e7_c. Music is Creative Commons licensed for non-commercial usage. You If you replace it, please include a version of our credits if you edit things. Visualizations also can be seen on YouTube at www.youtube.com/user/hubblesitechannel. You are free to use the video clips, stills and images as it best fits your needs, provided that you display credit. All the materials are released under the Creative Commons Attribution 3.0 License, and are available in the highest resolution online. Loch Ness Productions Bonus Shows. Some of these shows have no license fees, and are available for download. For others, Loch Ness may charge for making the movie encodes, and/or the media they ship them on. http://www.lochnessproductions.com/shows/bonus_shows.html. 26 March 2015. A 65 second PSA was shown at DUG (won award) & GLPA. Digistar Users can download from library. Otherwise--Robert Bonadurer can send you the dome masters--if you send me a drive. Download from https://youtu.be/-YpTAcEQ5Vk. 17 October 2018. A 5-minute 30-second time-lapse video of the 21 August 2017 eclipse, set to music, free to anyone who would like to use it. The video was shot by Joe Woolbright, and the original music composed by David Fogel, who has made the video available. Contact Fogel at david@davidfogelmusic.com for the HD digitally remastered mpg4 file. You can preview the video on YouTube at https://www.youtube.com/watch?v=zzXWPciTcAI. Aug 2017. Rice University with NASA Heliophysics Education Consortium support commissioned Don Davis to create fulldome animations of the geometry of solar and lunar eclipses. Previews at: http://space.rice.edu/eclipse/eclipse_animations.html To get higher resolution, non-watermarked versions, first sign up for the email list at http://bit.ly/Eclipse2017 to learn of updates and then email Pat Reiff with the size you need for your theater. January 2017. Above are thumbnails of free domesaver previews from Ken Scott at Digital Chaotics. 1-2 minute abstract "visual music" videos in seamless loops. Add music and/or logo for walk-in clip or show opener. Visit www.digitalchaotics.com. for more information.